An RV allows you to enjoy an affordable getaway. However, you don’t necessarily have to cut yourself from the rest of the world while you’re on an adventure. You can still keep yourself updated with the latest news and watch your favorite shows by installing a TV and TV antenna. With these, you can also update yourself with the weather report, so you can adjust your trip accordingly. When choosing a TV antenna, you shouldn’t settle for less. Only the best TV antenna for RV will give you a signal that will allow you to reach the best channels. So how do you decide which product to buy? King has a good line-up of antennas and RV media, so I’ve my hopes high for this product. 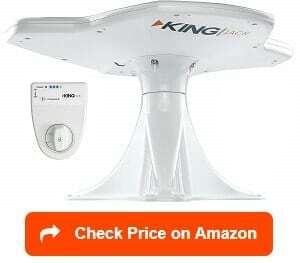 And they have indeed added a lot of great features in this King RV TV antenna. First of all, King Jack OA8300 is easy to install. The instructions are easy to follow, and the package comes with universal mounting brackets for the RV. In fact, it only took me about 25 minutes to set it up. Once I hooked it up and ran a channel scan, I was able to get more than 30 channels. It’s use of the improved UHF signal reception is impressive. You can get better coverage when you maximize the reception. While it provides 80% better signal for DTV channels, it has maintained its reception of VHF channels, so you can enjoy TV watching more. I also like the sleek design of this product. It can easily blend well with your RV. Also, it is 70% smaller compared to the traditional TV antenna. Still, what I love best about it is that it comes with retrofit upgrades that allows upgrade batwing to digital HD. If there’s something I wish I can improve with this product, however, it will be its stability. 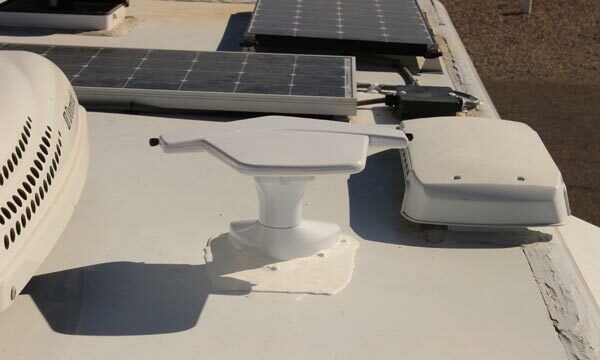 For those with Winnebago Aspect RV, you might find it difficult to find space to put the antenna flat on the roof. Should you buy this product? In any King Jack antenna review you read, you’ll find that King OA8300 is most recommended for getting a long-range signal. 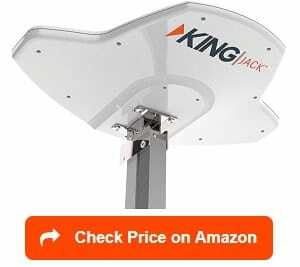 King jack antenna OA8500 has been highly recommended by critics. This product, like others in the King Jack line, uses the latest technology to bring you the best directional over-the-air antenna. This means better signal and more free channel. The design of this antenna is sleek; it uses high-tech features with an easy-to-follow installation manual. I mounted this antenna on my old mast, and they work well together. I was also able to use my old power supply. When installing it, I think it’s better if you mount the antenna, so that the coax connection is facing the rear of the RV and the mast can retract in that same direction. Of course, King OA8500 is aerodynamic and compact, so it minimizes wind resistance. It is also about 70% smaller than the traditional RV antenna. Though smaller, it is designed for getting long-range signal. When I used my signal meter, I saw it does pick up stronger signal, thus able to show a few more channels. It does not become weaker even when I lowered the antenna to 12”. Also, the package comes with a Signal Finder, which you can use to find local TV channels. The interior knob of King Jack OA8500 can rotate 360 degrees so that there are no dead spots in the coverage. Overall, this product’s durability and strong performance makes it one of the best RV over the air antenna. It can meet the demands of your RV. However, the package does not come with a roof mounting plate. Also, the warranty is only limited to 4 years. If you’re looking for the best RV antenna replacement for some time, then you might have heard of Winegard already. Along with King, they are considered to be on top of the market. This Winegard RV TV antenna, in particular, performs exceptionally well that it would be a sin not to include it in the list. What I like most about it is that it has a range of over 55 miles, so you can enjoy watching several local programs wherever you may be in crisp HD. It can receive both UHF and VHF signals. After all, this is what everyone is looking for in their RV antenna. How can it get such strong signal? It turns out that Winegard has combined their Sensar II antenna with UHF enhanced antenna, so you can get the best over-the-air TV viewing. The company has spend decades working on their antennas to continually improve them. The installation is fairly easy as clear directions are included in the manual. It took me 30 minutes to install the Winegard RVW-395 alone, which is reasonable enough. You can raise, lower, and rotate this antenna with just the hand crank, which is found inside the RV. I also like how Winegard tested this antenna for its UV and environment impact. The results show that it’s safe to use. However, Winegard RVW-395 is not yet a perfect product. The construction is kind of cheap. As some of the gears are made of plastic, it feels that they can strip out anytime. Also, I find that the mast tubes are a bit shorter. If you want a longer mount, you have to buy one yourself. 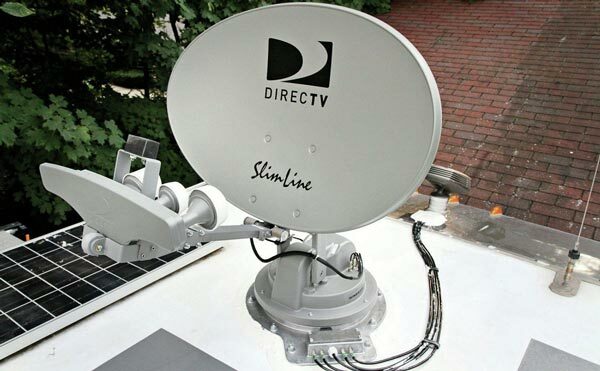 Winegard boasts that SK-SWM3 is the only RV satellite antenna in the market that’s compatible with a DIRECTV HD programming. I am very impressed with this feature as it no longer requires you to test signals with a handheld signal strength meter and compass. You can simply sit back and wait for the antenna to tune itself. 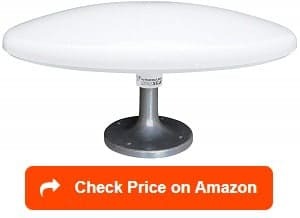 This omnidirectional RV TV antenna can view all DIRECTV satellites to maximize HD programming from 103, 101, and 99 satellites. It has been approved by reflectors and certified to provide the strongest signal. The installation took a little more than an hour without any assistance. If you want to install it more quickly, you need to hire a professional or ask someone to help you. This auto aiming dish is quite large and heavy, so you have to be careful. In fact, it’s not advisable to install this system if it’s your first time to do so. Once set, you’ll be able to power the system up and watch TV in just 5 minutes. The Winegard SK-SWM3 allows the whole family to watch multiple channels at the same time. Thus, it’s great for those who are going on a family trip and are prone to simultaneous TV viewing. But you must remember that the DIRECT HD receiver and the program for HD viewing are sold separately. 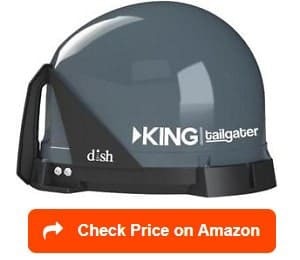 If you want to enjoy live DISH HD TV wherever you drive with your RV, then you’ll find that the King VQ4500 is one of the best in the market. It is specifically designed for those who love the outdoors. You can use it anywhere– in the RV, at a camping site, or stadium parking lot. But what really makes it different from other antennas? King VQ4500 allows you to receive all your favorite programs including your local channels. You only have to pay for the months that you’ll be using it. You can watch weather news, movies, games, TV series, and more. This satellite also supports multiple TV viewing, so it’s good for a family trip. It most ideal for those who are tired of setting up their tripod dish and putting it away while camping. Because this is an automatic-aiming antenna, I found it easy to set up. In fact, it can work as soon as it’s out the box. This weighs about 8 pounds, so it’s portable enough to bring to camping trips in your RV. 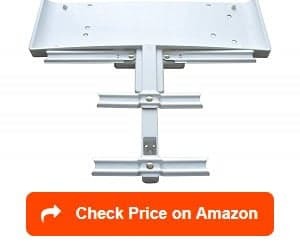 You can mount it on the roof of your RV without any additional bracket. 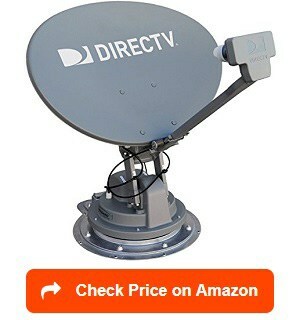 One thing you must know about this satellite, however, is that it does not pick up HD programming. If you want to have it, you can purchase an DISH HD receiver separately. You might also wonder why it does not pick up some local channels. Most satellites can only pick up channels on the 101 satellite; the same is true for King VQ4500. If your locals are on the 119 satellite, you might need to buy the King UC1000 universal controller. Winegard RS-3000 antenna has an aerodynamic design; it is strong, weatherproof, and UV-protected. In other words, it can withstand the harshest weather, so no matter where you go in your RV, you don’t have to worry about it. When installing this antenna, it took me about one hour. However, I will not recommend that you do it yourself especially if you don’t have previous installation experience. A professional can do the job in less than 30 minutes. Once successfully installed, you can enjoy its 360-degree signal reception. You will be able to receive UHF and VHF frequencies. Winegard says that Winegard RS-3000 has a 35-mile long range. However, as I’ve tested it, you can only get local reception as long as you are not over 25 miles away from a known tower. Of course, you can amplify this by using the antenna amplifier. Upon running a scan, I got more than 40 channels. The antenna does not require aiming, so it’s simple to use. In fact, you don’t need to lower it before you travel. Winegard RS-3000 does not only allow you to get local channels but it also comes with free digital TV programming. You can watch live sports, local news, and TV shows for free with it. 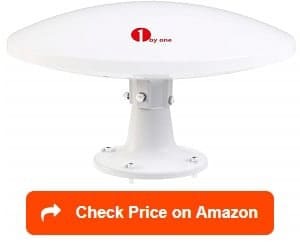 Uniquely designed and fully functional, 1byone Amplified Omni-directional Waterproof RV Antenna is one of the best RV antennas that you’ll find in the market. Aside from its sleek design, you’ll also find that it is easy to install. You won’t need to hire an expert to install it for you as you can do it in three simple steps: unwrap, plug, and scan the channels. Since it’s compact, you won’t have a hard time lifting it and setting it up like you would if you were handling a traditional type of antenna. Unlike most antennas that are pointed upward, this antenna has a circular shape which is what gives it its omni-directional properties. Once you already set it up, you’ll be able to receive signal out a 360 degree radius. Also, there’s no need for a remote control when you want to look for signal. Since it is omni-directional, the signal will come to you and not the other way around. Of course, how strong the signal is depends on where you are. Winegard is all about simplicity and effectiveness. When it comes to range, the Winegard RVW 205 Sensar Wingman definitely does its job. It is able to pick up signal of over 55 miles away, allowing you to get clear reception on your channels. To add to its already strong signal pick up, it also has a built in amplifier that can even pull in good signal for the weaker channels. This allows you to always get HD reception. Aside from its functionality, one thing you’ll love about this product is that it isn’t sensitive and lasts really long. This is because it has a powder coating that protects the antenna from any external factors. It can last for many years even under the harsh weather. If you happen to travel to an area that rains a lot or has snow storms often, you can still be guaranteed that your RV antenna will be able to withstand these conditions. Winegard RVW 205 Sensar Wingman is lightweight. Thus, it’s easy to carry around. However, because of this same feature, it can be a bit flimsy. This model is great for road travelers. It is one of the most popular models of Winegard as it has one of the longest range reaches with VHF capabilities. This allows you to get clear reception on even the weakest channels. It also has Free OTA programming to give you a variety of options for channels. The best part is that it can do this anywhere at any time. Since it has a compact size, it’s also really easy to install. All it takes is just three steps that you have to follow: (1) open up the Sensar antenna; (2) take out the bumpers from the bottom; and (3) put the holes with the holes of the bumper and attach. 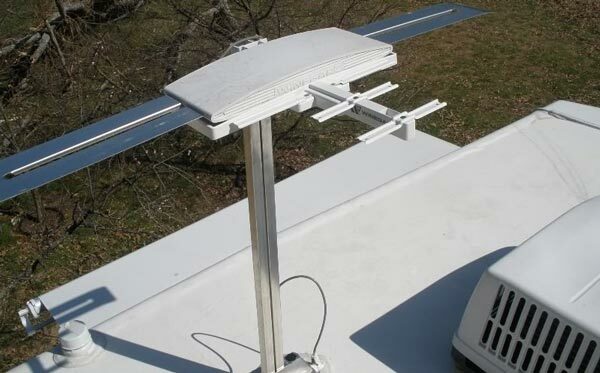 After which, just mount the antenna on the top of your home roof or trailer, and you can start scanning the channels. 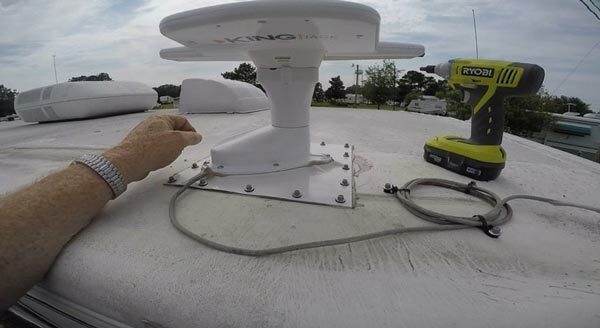 Though compact, Winegard RV WING Wingman Booster Antenna has a flimsy design. You might not able to use under harsh weather conditions. 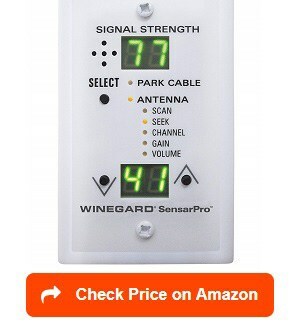 The Winegard RFL 342 SensarPro Signal Strength Meter is usually bought alongside the Winegard RV WING Wingman Booster Antenna or other Winegard antenna models. This meter allows you to scan the channel modes so that you’ll know how to adjust your antenna. It does so by telling you which channels have the most and least reception. Not only does it allow you to detect signal quality, but it also works as an RV TV antenna booster as well. With one press, you can increase the capacity of the antenna to pull in signal. You can also decrease the signal if you think it’s overloaded. It’s not complicated to control this antenna. The most important thing you have to know is how to work the five modes. These are the Scan, Seek, Channel, Gain, and Volume modes. Each mode has its own specific purpose on how it can get you the best quality reception from your antenna. The package comes with a manual allowing you to study how to use each mode. What makes the best TV atenna for RV brands different from other products in the market? For you to fully understand the answer to this question, you have to know exactly what you should look for in an antenna. Determine how far your antenna can reach and what kind of satellites it has access to. Usually, antennas that have higher coverage are a better choice. If the signal reception distance is low, you might have to buy an antenna booster. You have to consider which type of antenna you want to buy- indoor or outdoor. Remember that the outdoor type has better coverage but a bulky size. The indoor one, on the other hand, is more compact and can fit indoors but has a lower coverage. You can also base your choice on the kind of material that’s used for the antenna. Most of the antennas are made out of plastic while others are made out of aluminum. If ever you buy an outdoor antenna, it’s more recommended that you buy an aluminum type because they’re sturdier and more durable. They also won’t rust even if it rains. Plastic ones are good for indoor antennas. If you want to receive DTV signals from all of the stations around your area, then your RV antenna should be able to pick up both UHF channels (channels 14 to 51) and VHF channels (channels 2 to 13). There are antennas that can only pick up UHF channels or VHF channels, but not both of them. Be sure to check the description carefully. Most of the RV antennas these days have Wifi capabilities, so this is something you may want to look into. If you need to access the internet while you are in the woods, choose the antenna that has a strong Wifi capacity. Weight is also important, especially if you’re going to buy an outdoor antenna. Flimsy, lightweight outdoor antennas are not good for places that tend to have strong winds and have a lot of tree branches. If you’re in a windy area or region with strong weather, then you may want to buy a bulkier one. If not, you can buy a lightweight one, so it’s easy to handle. Lastly, you have to take into consideration the price of the product you want to buy. Avoid getting the ones that are too cheap because they might not last long and give you what you need. If it’s your first time to buy an RV antenna, you probably don’t know the details about how it works. 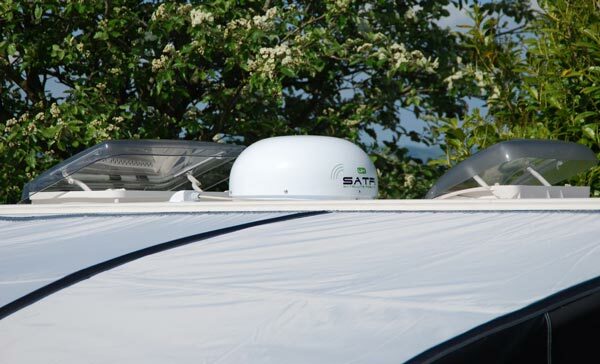 Even if the best TV antenna for RV brands were mentioned above already, it’s important to know about them so that you’ll know why they’re the best RV TV antennas for digital TV or any other TV for that matter. To put it simply, an RV antenna is a TV antenna that is easily installed on a house or trailer. It is often used by travelers and campers when they decide to go camping. Even out in the woods, they’ll still be able to get reception and a good list of channels if they have an RV antenna attached to their television. The best thing about an RV antenna is that it has a wide range, which means it is able to give you a variety of channels for you to enjoy. Outdoor RV Antenna: This is the type of RV antenna that is placed outside your home or trailer. It happens to be the one that is more effective in picking up reception since it is more exposed to the signal outside. This is also the type that is usually used when road traveling in a trailer. The only issue with this type of RV antenna is that branches or leaves could fall on it blocking its capabilities. However, you can clean it from time to time or fold it if you’re not watching TV at night. Indoor RV Antenna: The other type of RV antenna is the indoor type which has a little bit less range than the outdoor type. While it lacks range, it makes up for it with convenience. As the name implies, the indoor RV antenna is placed indoors. With this, you won’t need to keep it away from branches or leaves. You can just leave it on top of your TV and turn it on whenever you need to. 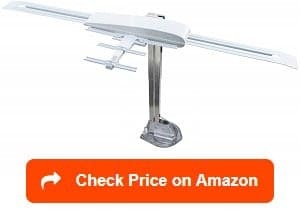 If you’re not that particular with high definition quality or variety of channels, then you’ll most probably be satisfied with an indoor RV antenna. However, the best indoor TV antenna for RV can still give you pretty good definition and range. You’ll be able to watch TV while traveling: Even when you go camping in the woods, an RV antenna with a wide coverage will be able to get you the channels that you usually watch when you’re at home. You don’t have to miss an episode of your favorite show even if you’re miles away from your locality. You’ll be able to connect to the Internet: If you have some work to do while you’re going camping, you can still connect to the internet if you have an RV antenna. If the RV antenna can detect signal, it can connect your device to the internet via Wifi properties. With really strong internet connection, you’ll even be able to stream movies and download programs on your computer. You don’t need to subscribe to watch local shows: Usually, you would have to subscribe to the local TV and cable provider in order to watch local shows. With this device, you won’t have to pay to watch any of the local shows anymore. The RV antenna will be able to pick up the signals and give you the local channels without you having to subscribe. You can get shows in HD: Because an RV antenna can pull great reception into it, you’ll get the best signal so you can watch your shows in high quality definition. When using your RV antenna, it’s normal to experience some problems. 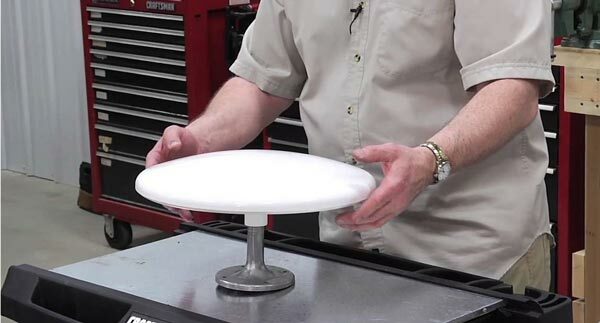 Here are some of the most commonly asked questions among RV TV antenna users. Generally, all you have to do is install the antenna, and you can start using it. Most antennas in the list just have a plug and play installation, so you don’t need to pay for installation. Just follow the manual, and you can start scanning for channels. Also, check the reception every time after you install to see if you’re getting the right reception. How to point RV TV antenna? There is really no right direction as to where to point your antenna. You have to slowly turn the antenna in one direction first and then scan for channels. If you’re not getting the reception that you want, then turn it a quarter and rescan again. One way to get better reception on the camper antenna is to invest in a good booster. Boosters can help you get more signal so that you can have access to more channels in high definition. Do take note that you may run into some RV antenna booster problems in your first few times of use. However, take time to learn how to use it. What is additional hardware required? Some other additional hardware you can get to enhance your experience would be the signal strength meter and a signal booster. The meter will help you monitor the signal strength and the booster will help you enhance the signal. How to troubleshoot King jack antenna? If you’re having some trouble with your King Jack Antenna, such as getting pixelated screens or no reception at all, you can troubleshoot it by rotating the attenuator. To do this, you first have to turn on the power injector and the King SureLock Signal Meter. You can find the on switch near the rotational knob. After that, turn the attenuator to the right. Then, press the button located on the knob. Rotating the attenuator this way should allow you to get the reception that you want. RV antennas are definitely useful if you like watching TV while you’re on the road. However, buying one is not as easy as most people think. There are a lot of things to consider before you buy one. If you’re looking for the right TV antenna for RV, then you must first know exactly what you’re looking for. The weight, material, reception coverage, etc. should all be considered. Once you know the features that you should look for in an antenna, you must explore the best TV antenna for RV brands in the market. You must understand that there’s no perfect antenna for all people. Your choice should depend on where you usually travel and what kind of channels you want to watch. We would like to thank you for reading this article. Find out more about how to choose the best wifi boosters for RV, best RV GPS and best RV tire pressure monitoring systems 2019 with our reviews and ratings. Furthermore, please take a look at the best cell phone boosters for RV, best RV backup cameras and best TV for RV to choose the right one for your RV electronics. I’m not sure I would have included satellite dishes along with TV antennas. The title said 10 best TV antennas, dish is just that, a dish. 🙂 Thanks. Have you found the right one for your RV? The King Jack is a piece of crap and poor reception. Why can’t a company today make an RV H D OTA antenna with great re option. 35 mile reception is not enough. As soon as someone makes a replacement for my King that has at least 60 mile reception ability I will be the first one to replace it. Oh, Thanks, Michael. I will consider your recommendation. I am looking to replace my surface mounted omnidiectional antenna. My trailer has two AC units on the roof and the antenna sits in between them with some space separating them. Most people recommend the King Jack. My dealership recommends going with a crank up Winegard. Does the height of the antenna matter if it is between two AC units?